GDP 3.2% -- NOW THE REST OF THE STORY! On Friday, January 28th, the Commerce Department reported a 3.2% GDP growth in the U.S. economy for the 4th quarter of 2010, which barely raised an eyebrow on Wall Street since the focus was on the unrest in Egypt. At the time, there were a few thousand protesters in the streets of Egypt, giving the momentum traders on Wall Street incentive to sell off the market in spite of the good GDP report. Many commentators argued that the forecast for the GDP wound up being 0.3% lower than the originally forecasted 3.5%, and that this was a negative sign for the economy. Anytime I hear that explanation for why the stock market went down, I wonder if the real issue is that the commentators don’t have a grip on the actual news. This past weekend was beautiful in Atlanta with the temperatures approaching 70 degrees, and I was lucky enough to actually get out and hit some golf balls. I rather doubt that any of my Atlanta readers read the Commerce Department’s GDP report this weekend instead of enjoying the excellent and unseasonable weather. In any event, reams of positive information from this report went totally ignored by the financial commentators. One of my goals for my blog posts is to provide my readers with information that is not readily available in the financial press. As you likely know, GDP is the gross domestic product of any particular country. While the U.S. has the largest GDP of any country, it has suffered a major decline over the past few years. With the Commerce Department’s 4th quarter GDP report, the annual GDP of the United States borders on $13.86 trillion. This is equal to the 2007 GDP before the recession started. On a per capita basis, GDP has yet to reach pre-recession levels, but the fact that we have gotten back to even is quite an accomplishment. I continually read that China’s GDP will soon overtake the United States. While it’s true that China’s GDP is reported to be growing at approximately 10% annualized, their economy is only at $5.3 trillion in 2010 as compared to the U.S.’s almost $14 trillion economy. It will be a few more years before China’s economy even approaches the U.S.’s mammoth economy. Additionally, China’s economy simply cannot grow at those levels without a setback in a few years. I can't help but be impressed by the components of the GDP report. One observation that seems to be overlooked is the definition of a recession. Most economic textbooks define a recession as two consecutive declines in quarterly GDP. While there’s no question that the U.S. suffered a recession in late 2008 through the beginning of 2009, the real question is why didn’t we have a more robust recovery after it was over? Beginning in the middle of 2008, the U.S. suffered four negative GDP quarters. Beginning with the GDP for the 3rd quarter of 2009, GDP started turning up. The Commerce Department has now recorded six positive GDP quarters since that time. Volumes of articles have been written regarding the possibility of a double-dip recession in the United States with many respected economists forecasting that a double-dip recession was almost inevitable given the U.S. economy’s weak recovery. You may recall that I dismissed such a possibility a year ago in my February 6, 2010 post, Ding-Dong! The Recession is Dead, and I reiterate now that there was never a possibility that the U.S. economy would slip back into a recession. 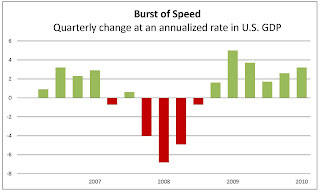 Given the strength of the numbers illustrated below, the U.S. economy in the 4th quarter of 2010 was refreshingly robust. Buried in the Commerce Department’s numbers were some outstanding increases. Final sales is a good indicator for demand in the economy, and it had its largest increase since 1984, growing 7.1%. Just think about that growth percentage – it took almost 30 years for the economy to snap back to such a large percentage in final sales. When final sales are so large, it’s natural to wonder why GDP would be reported at such an anemic level of 3.2%. How GDP is calculated is partly the answer. One of the GDP calculation components is the effect of inventories. During this quarter, it would be natural to conclude that inventories would be diminished. Given the Christmas season and the seasonal sales that occur during that time, inventories would naturally be lower at the end of December than they were at the beginning of October going into the increase in inventory for the Christmas retail season. During the 4th quarter of 2010, private inventories were at -3.7%, creating an enormous drag on the calculation of GDP. This percentage decrease was unusual given that it followed five quarters when inventories were increasing. This illustrates the strength of the Christmas season that inventories took a major decline. You would have to be living under a rock to not realize that businesses will increase and inventories will replenish to pre-4th quarter levels. As the significant increase in inventories occurs, due to the calculation of mathematical economic ratios, we should see GDP shrink. It’s almost guaranteed that with the turnaround in inventories, the GDP growth in the coming quarters will be robust. Interestingly, the decline in inventories was greater than the decline during the heart of the recession. 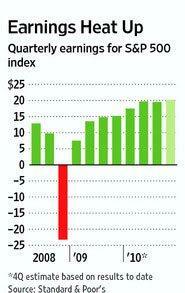 The fact that inventories had gone up for five consecutive quarters underscores the significance of this decline. The GDP report had more positive news for the economy. The values of exports went up 1% and have been up now six straight quarters. This is important because it indicates that U.S. manufacturing is growing and the U.S. has become more competitive in worldwide markets. Also significant is the fact that imports during the 4th quarter declined. Exports increased while imports decreased, which are moves in the right direction since they reflect that U.S. manufacturing is up while our reliance on imports has decreased. Almost assuredly, as U.S. companies increase the levels of their inventory, both of these components of U.S. manufacturing shall be positive. It’s also important to realize that 70% of the calculation of GDP has to do with personal consumption. Personal consumption in the 4th quarter of 2010 was at 3% -- the highest it has been in years. Therefore, almost every component of the GDP calculation was extraordinarily strong except for the liquidation of inventories, which almost assuredly will move upward in the coming quarters. It appears that based on the empirical evidence offered by the Commerce Department’s GDP report, we should expect significantly higher GDP growth in the 1st and 2nd quarters of 2011. GDP in the 4% range would be above trend if it occurs. In my January 25, 2011 post, Dow 12,000 - Who'd a Thunk It, I commented on the strength of earnings for U.S. corporations. It was interesting to read the analogy on the same subject in Monday morning’s Wall Street Journal, U.S. Corporate Markets Surge, which illustrates extraordinary growth and earnings for the S&P 500 companies. As you can see, I don’t make up the information in my posts – they are based on facts. If corporate earnings are up like gangbusters and we expect higher GDP growth in the coming quarters, what investment analogy can be drawn? First, you have to assume that higher stock prices are based upon higher earnings, an analogy I have illustrated often. With higher earnings and higher GDP, we should expect higher stock prices. With a better economy, we will almost assuredly not enjoy the support of the economy that the Federal Reserve has been offering. Quite frankly, the Fed is way overdue in increasing interest rates. As I’m sure you’re painfully aware, bond prices move inversely to interest rates. It’s certainly likely that bond prices will be negatively impacted by higher interest rates in the coming months. In summary, stocks will be higher, bonds will be lower, and your financial future will be more stable if you make additional investments for your future.